3M Tagaderm Transparent Film Dressing Frame Style are designed for protecting skin and wound sites. Frame style allows customization of shape and size to fit any site and difficult to dress areas. The dressings are versatile and can be used for many applications including I.V.s, chronic wounds, acute wounds and skin protection. They are transparent to allow for precise placement and easy wound and / or I.V. monitoring. 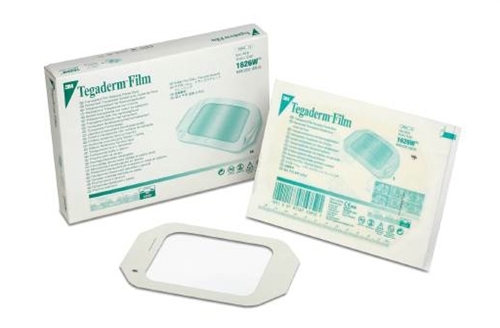 Tagaderm Transparent Film Dressing Frame Style are breathable and aloos skin to function normally. They protect the site from external contamination and form a fluid, bacterial and viral barrier. The popular picture frame delivery system allows tension-free dressing application. The dressings also conform to the body and flex with skin for greater patient comfort. Kendall Curity Cover Sponges Comfeel Plus Contour Dressing Butterfly Shaped Elta SilverGel Clear Gel McKesson Universal Utility Scissors 7-1/2"